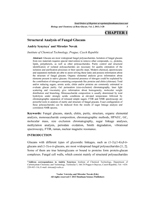 Glucans are most widespread fungal polysaccharides. Isolation of fungal glucans from raw materials requires special intervention to remove other compounds, i.e., proteins, lipids, polyphenols, as well as other polysaccharides. Purity control and structural identification of isolated polysaccharides are necessary for quality estimation of the isolation and purification processes or their specific steps. 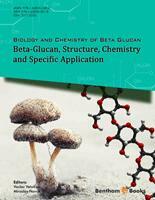 Modern chemical, spectroscopic and separation methods are able to assist solving these tasks and possess information about the structure of fungal glucans. Organic elemental analysis gives information about elements present in native glucans. Occasional presence of nitrogen could be explained by the contribution of nitrogen-containing compounds like proteins and chitin (chitosan). Total and/or reducing sugars, uronic acids, chitin and/or proteins are commonly estimated to evaluate glucan purity. Gel permeation (size-exclusion) chromatography, laser light scattering and viscometry give information about homogeneity, molecular weight distribution and branching. Monosaccharide composition is usually determined by total hydrolysis under strongly acidic conditions at elevated temperature followed by chromatographic separation of released simple sugars. FTIR and NMR spectroscopy are powerful tools in analysis of purity and structure of fungal glucans. Exact configuration of these polysaccharides can be deduced from the results of sugar linkage analysis and correlation NMR spectra.